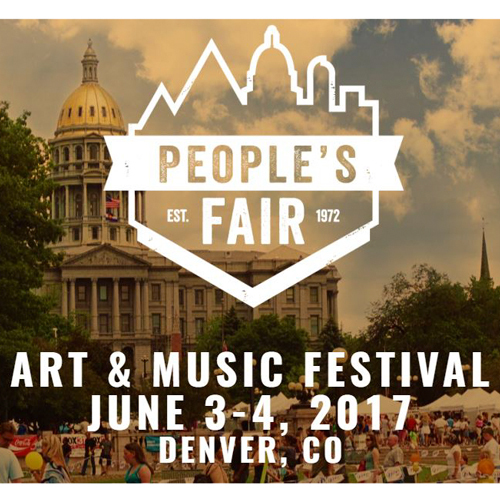 This weekend Denver’s Civic Center Park will welcome the community to enjoy art, food, entertainment, and family fun for the 45th annual People’s Fair. Denver’s oldest neighborhood fair invites public groups, artists and neighbors from every corner of the city to celebrate the community while kickstarting summer. The first People’s Fair was held in 1972 on the grounds of Morey Junior High School as a bridge between Capitol Hill residents and City Hall and the Denver Police Department. That year, 2,000 people attended the event. The fair outgrew the venue and was moved to Civic Center Park in 1987, with the same purpose of uniting Denver’s various neighborhood groups. Now, organizers estimate it draws crowds numbering in the hundred thousands. Enjoy all the fair has to offer with rides, games, arts and crafts, sport activities, great food, music and more. Get your zen on with a free yoga session Saturday or Sunday morning. Stop by the marketplace to speak with local vendors and choose from a variety of handmade crafts and delicious culinary delights. Proceeds from the event will benefit Capitol Hill United Neighbors (CHUN) in their mission to protect, preserve & enhance the quality of life in and around Capitol Hill. Good Chemistry is a proud business member of CHUN and our team will be out in full force volunteering time to help coordinate the fair. CHUN is just one of the organization’s Good Chemistry is proud to support. Learn more about those organizations and how to support them here. Join us this weekend in a celebration of art, music, culture and community at the People’s Fair! Check out out the full schedule of events here.